Ministry of Propaganda - 07/Jun/2006: "Strange Practices at npower"
I've just received my latest electricity bill from npower. On the bill it says Recent price changes have been applied to this bill. 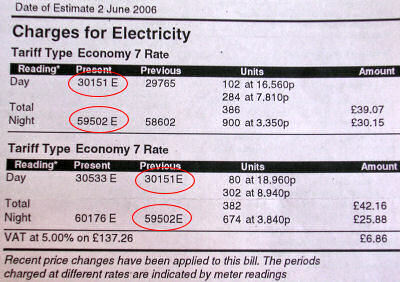 The periods charged at different rates are indicated by meter readings . No problem with that as such. However, the interim meter readings are estimates. Is this real? Are they really asking me to pay increased prices for the period after the price change based on an estimate? Don't get me wrong, I don't have a problem with estimates as such. If the estimate is wrong I can provide my own meter reading or 'catch up' on the next meter reading. Only that is not possible here, as the time to check the meter at the time of the price change is obviously gone. I could therefore be overpaying npower based on incorrect meter estimates.